Don’t know if anyone reading this has had their fill of The Hunt For Vulcan, but just in case you haven’t, I’ll be talking soon about that book, missing planets, error in science (and life, perhaps) and more with Jay Ackroyd on his internet radio program, Virtually Speaking. For A Good Time In Tucson…And Then Tn Charlottesville. Way late with this post, but if any of y’all happen to be in the Tucson, AZ area this weekend, I’ll be doing a bunch of stuff at the excellent Tucson Festival of Books. It’s truly an all-in event; just an outrageous amount of book love crammed into two days. My own motes in this maelstrom come at 10 a.m. and 4 p.m. both days. 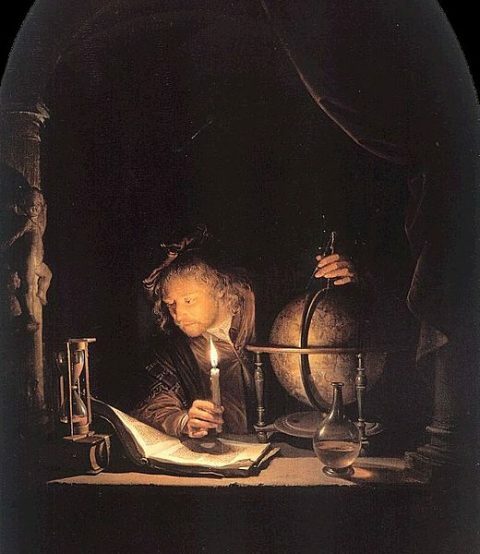 On Saturday, I’ll be participating in a couple of panels, “Genius: Lives in Science” in the morning and “How We Got Here: Histories of Science” in the afternoon. Sunday morning I’ll be doing a workshop/Q & A on science writing — how that will go will depend on who shows up and what they want to talk about — and in the afternoon we’ll be on to “Our Nearest Neighbors In The Solar System,” a chance to talk Planet Nine, Kuiper Belt Objects, those funky moons that orbit the Pluto-Charon system…and maybe just a bit about our should-be, could-be, never-was friend, Vulcan. Some come by if you can. And check out everything else going on — or rather, as that’s more than any one person could manage, check out what you like. Also — an author’s plea. If you happen to have read The Hunt for Vulcan (so nice I linked it twice) do tell your friends, and if you’re feeling extra generous, pop up a review on Amazon, or whatever social media venue floats your boat. Also, also: for anyone in the Charlottesville, VA vicinity next week, I’ll be talking at the Virginia Festival of the Book as part of a panel on “Mysteries of the Cosmos.” That’ll be on Friday, March 18 at 4 p.m. That’s another great celebration of writing, reading and the wondrousness of words; it too has an amazing line up of authors, with only yours-truly mucking up the joint; and a spring weekend spent in sight of the Blue Ridge is never wasted. And just to broaden out the thread — how about talking about what you’re reading now. For me, I just finished work in a genre I don’t usually read much: N. K. Jemisin’s Inheritance Trilogy, which I enjoyed a lot, and to which I turned after being truly wowed by her The Fifth Season — a novel of geophysics, race, love and vengeance. I’m not sure what the next novel will be just yet. My non-fiction jones is being fed by a dual read of Andrea Wulf’s The Invention of Nature: Alexander Humboldt’s New World and Humboldt’s own Personal Narrative of Travels to the Equinoctial Regions of America, and a nightly, just-before-bed dip into Susan Howe’s My Emily Dickinson — which is just wonderful, a poet diving into another poet’s life and work in a bravura demonstration of criticism as high art. 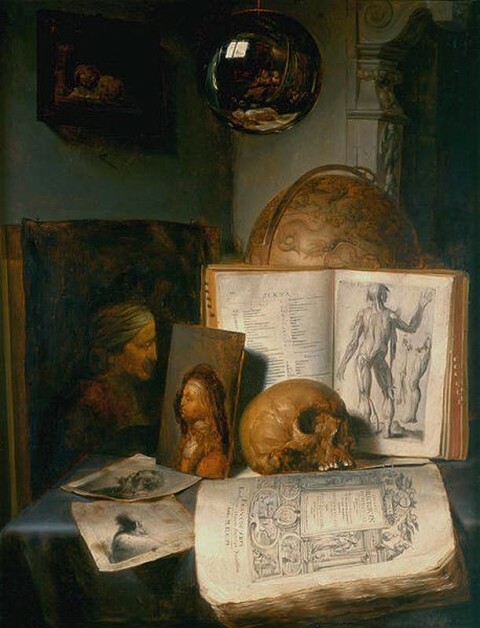 Image: Simon Luttichuijs, Vanitas still life with skull, books, prints and paintings by Rembrandt and Jan Lievens, with a reflection of the painter at work, betw. 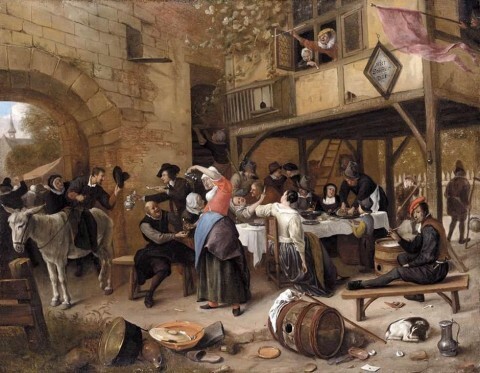 1635-1640. Nothing but unicorns and rainbows in this post. Every now and then, rarely, a book comes along that makes you want to grab strangers on the street and hold them by their shirtfronts until they promise — pinky swear, no mental reservations allowed — that they will get and read that irreplaceable book as soon as you let them get go. I’m a few pages into that book. So I’m doing all that to you, grabbing hold as firmly as I can, to the limit our intertubes allow. The work is Helen MacDonald’s H is for Hawk. 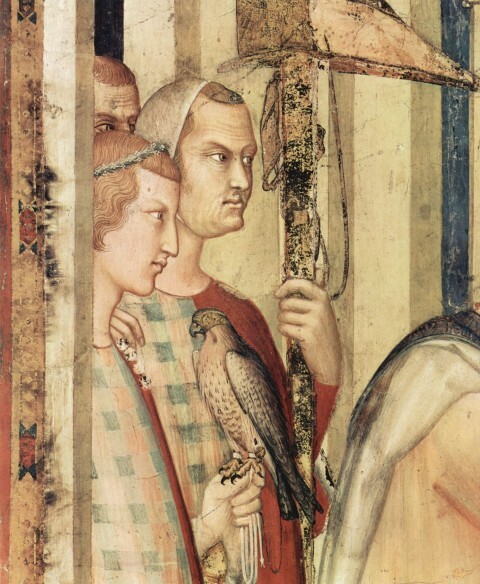 * It is a work of intensely observed natural history, if that’s the way you take it. From another angle, it’s a memoir of grief. From any point of view, it’s a work of art. MacDonald’s prose is simply beautiful: resonant on the sentence level, unbelievably sharp — you’ll cut yourself on her images — and even in the slow entry I’ve allowed myself so far,** possessed of an accumulating beauty that reminds me of something I too easily forget, why it is I love the practice of words. Forty-five minutes north-east of Cambridge is a landscape I’ve come to love very much indeed. It’s where wet fen gives way to parched sand. It’s a land of twisted pine trees, burned out cars, shotgun-peppered road signs and US Air Force bases. There are ghosts here: houses crumble inside numbered blocks of pine forestry. There are spaces built for aid-delivered nukes inside grassy tumuli behind twelve-foot fences, tattoo parlours and US Air Force golf courses. In spring, it’s a riot of noise: constnt plane traffic, gas guns over pea fields, woodlarks and jet engines. It’s called the Brecklands — the broken lands — and it’s where I ended up that morning, seven years ago, in early spring, on a trip I hadn’t planned at all. At five in the morning I’d been staring at a square of streetlight on the ceiling, listening to a couple of late party-leavers chatting on the pavement outside. I felt odd: overtired, overwrought, unpleasantly like my brain had been removed and my skull stuffed with smoething like microwaved aluminium foil, dinted, charred and shorting with sparks. Nnnngh. Must get out, I thought, throwing back the covers. Out! I pulled on jeans, boots and a jumper, scalded my mouth with burned coffee, and it was only my frozen ancient Volkswagen and I were halfway down the A14 that I worked out where I was going, and why. Out there, beyond the foggy windscreen and white lines, was the forest. The broken forest. That’s where I was headed. To see goshawks. A soft open indeed. Action, of a sort, but (as yet) not terribly consequential. A character, with whom we haven’t had the chance to form a bond of sympathy. Lists. 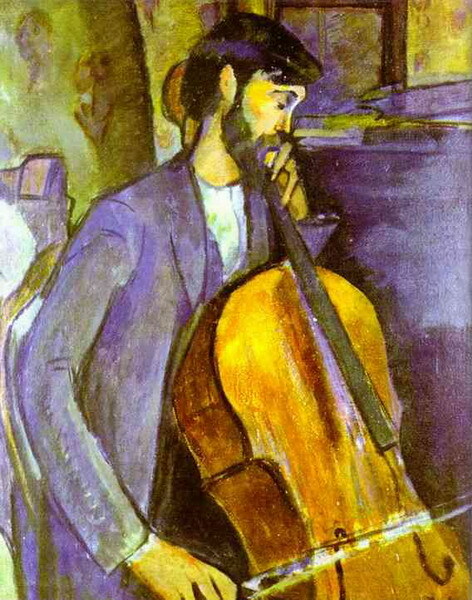 What I’m feeling on this read is the rhythm. MacDonald’s a published poet, among other things, and she writes prose that recalls that discipline, with word-by-word attention to sound and beat, to build into a play of sentences that imposes a kind of music on top of sense. As I’ve dived further into the book I forget, sometimes, to pay attention to that kind of fine-grained technique. Instead, I’m being carried along by who she is and why she’s doing what she’s doing. As Schulz says, this is a “wondrously atypical book.” It delivers its goods polyphonically; there’s always another level to experience. I’ll stop there, but I hope you won’t. I’m grabbing you, folks. I’m pulling hard on your lapels. I’m leaning in. I’ll speak slowly, so there’s no chance of a failure to communicate. Buy this book. Read it. *Amazon link for reference purposes. If you can support your local bookshop, it’s the policy of this blogger to encourage you to do so. **I’ve had to stop myself from dropping everything — sleep included — and racing too fast through this one. It really is that good. Attention Conservation notice [w. apologies to Cosma Shalizi, from whom the phrase is stolen]: What follows is what in the newspaper business used to be called a thumbsucker — in this case, yet another way to see the GOP as not just wrong, but so steeped in an error of principle, of worldview, as to be irredeemable. It’s got a nice anecdote in it, lifted from someone else, but there’s no need to read on if you don’t like such stuff. Which last is, of course, a PGO of its own. See: I’m fractally unnecessary. I’ve been doing a lot of reading lately, with (thanks to the exceptional luxury of a sabbatical) much more to come. I’ve started out by trying to catch up on some of the political books I’ve missed recently — and I’ll probably have some thoughts to share about Christopher Hayes’ Twilight of the Elites before long. I just finished Michael Sandel’s What Money Can’t Buy too, though I found it perfectly interesting, but less compelling than Hayes’ book for a number f reasons. Still that’s a philosopher’s take on the same problem explored in the book that prompts this post, Virginia Sweet’s God’s Hotel. Sweet’s work is a memoir of her doubled journey as a doctor at the last surviving American big city alms house, San Francisco’s Laguna Honda Hospital, and as a scholar trying to understand Hildegard von Bingen’s spiritual and practical approach to her form of medicine. Sweet’s book has been enthusiastically received, and I can see why, though it didn’t move me in quite the same way it seems to have for some others. It’s Sweet’s lack of struggle that gets me, I guess; there’s no doubt in my mind she did sweat and suffer over her 20 years caring for the poor, but in recollection the life unfolds with an easy rhythm, no matter how tumultuous the world around her might be. Sweet doesn’t romanticize much, and she never suggests that she, her patients or anyone should trade modern medicine and its quantifying tools for Hildegard’s actual practice. But she makes the point a good historian of ideas should: one studies the past not to recreate it, but to understand what its thoughts meant to its thinkers — and then what meaning those same insights may have in the radically different time and place in which the historian lives. Use Hildegard as a tool to probe what the consequences may be if we commit ourselves to life within Mitt Romney’s vision of America. Above all, the [consultants’] report said, they’d been amazed by the anachronistic presence of a head nurse on every one of the hospital’s thirty-eight wards. As far as they could tell, this head nurse did nothing but sit most of the day in her chair in the nursing station. She answered the phone, to be sure, and kept the charts tidy; now and again she when out and inspected a patient with one of her nurses. Also, she made coffee, kept the TV room and lounge neat, organized patients’ birthed parties and in general, did whatever needed to be done. It was a pleasant job [the consultants] observed, helpful, no doubt, but one hundred years after Frederic Taylor’s description of scientific management, and in a time of tightening health-care budgets, such a use of a skilled RN was excessive. They’d even seen one head nurse whose only task was knitting. That’s right, a head nurse who, as far as they could tell, spent all day in her chair at the head of her ward, doing nothing but knitting blankets and booties for her patients. It was a lesson in the inefficiency of efficiency. And the best way to explain is to tell you about the head nurse who knit…. 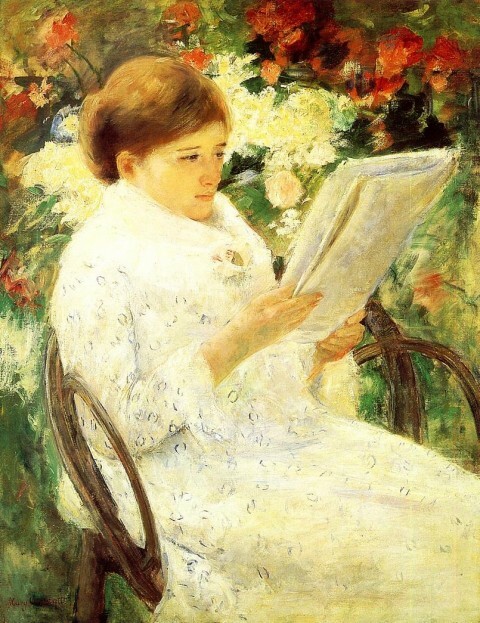 [hers] was a little-old-lady-ward, with thirty-six little old ladies — white-haired, tiny and old — and sure enough almost everyone one was wrapped in or had on her bed a hand-knit blanket; white and green, white and red, white and yellow. And there was the head nurse sitting in her chair at the nursing station, answering the phone, fussing with the charts, observing her charges, and knitting one of the few blankets remaining to be done. I’ve thought a lot about those blankets since the disappearance of the head nurses and their well – run neighborhoods of wards. About what the blankets meant and what they signified. And here’s the thing: The blankets made me sit up and take notice. Made me pay attention. Marked out that head nurse as especially attentive, especially present, especially caring. It put me and everyone else on notice. It’s not that the ladies for whom they were knitted appreciated them or even noticed them. Who did notice was — everyone else. Visiting family noticed. Looking down the center aisle, they saw two rows of little white-haired ladies — their mothers, great-aunts, and sisters — each lady bundled up in a bright, many-colored hand -knit blanket. They also saw that each had makeup on, and her hair done and her nails polished by the nurses who knew that, down at the end of the ward, was the head nurse, knitting. The Russian ambulance drivers noticed, when they rushed onto the ward to pick up one of the ladies…Even the doctors noticed. The blankets put us all on notice that this was a head nurse who cared. …those blankets signified even more than attention and caring. The click of that head nurse’s knitting needles was the meditative click of — nothing more to be done. Although it had seemed to [the consultants] that the head nurse did nothing except knit, that nothing was, as the Tao says, what the Superior Man does when everything that was supposed to be done has been done. We did get used to the new system eventually. The remaining staff learned to answer the phones, tidy the charts, talk to families, help the doctors, survey the ward and support one another at the same tim they were looking on the computer or filling out the forms that the new nurse managers created. But the new system had a cost. It was stressful. After the head nurses were cut in half, there were more illnesses and more sick days among the staff; there were more injuries more disabilities, and earlier retirements. Among the patients there war emore falls, more bedsores, more fights, and more tears. And this, in the broader scheme of things — even economics — is not efficient. …The [consultants’] report taught me not only the lesson of the inefficiency of efficiency. It also taught me the lesson of the efficiency of inefficiency. I don’t want to romanticize here, any more than Sweet does through her long narrative. To channel my inner Freud, sometimes the old ways of doing stuff really are outmoded. No one who has recently spent four years in academic administration needs to be reminded of that. But Sweet’s point is one I’ve been thinking of more and more as each Bain vulture capitalism story makes its way in and out of the Look! Shiny! media narrative. Sweet mentions that the consultants who got rid of half of the head nurses shifted $2 million in the budget. They collected $200,000 for their recommendation — an agreed 10% bounty on all “savings” their study produced. They correctly determined an individual inefficiency, and missed, in Sweet’s account, the systemic advantages of what seemed to their analytical framework, their faith, to be an obviously flawed system. And so it goes throughout the current GOP worldview. We know that the private sector is the GOP solution to (putative) problems in the public schools [paywall] by selecting the right measurement criteria. Bobby Jindal can determine the cost of libraries, but not the cost in money or possibility of their loss. The number wins; the uncertain future weighs for nought. The usual catchphrase for all this is privatizing profit and socializing risk — which is what the GOP seeks for social capital as much as the financial kind. Hence the stakes of this coming election. But beyond that pretty familiar notion, what came to front-of-mind as I read Sweet’s story was the reminder, if any were needed that the basic worldview of the two sides in this election are not the same, for all the overlap of interest and elite corruption and all that the circular firing squads of the left can (sometimes accurately) describe. I said this was meta, and it is, and I should probably let y’all get back to your Saturdays. But behind the consultant’s technical apparatus is a vision of a world of individual action and reaction. Cut here, save the money, Profit! Taken to the level of politics and national elections, it’s a vision (sic!) of a country best understood as an assemblage of 300 million individuals. Hence, among the adherents of this view, the furor over the suggestion that business folk had any help building their businesses. If you think that such a view of the lack of connection between one person’s endeavor and the next is the way to educate a population, receive health care in a timely and useful fashion, to innovate, then the GOP is for you. If you think we live in society in which individuals gain freedom of opportunity and access to experience supported by the links between the lives of all those 300 million — if you inhabit reality, that is — then we need to destroy the current GOP root and branch, now and for the forseeable future. 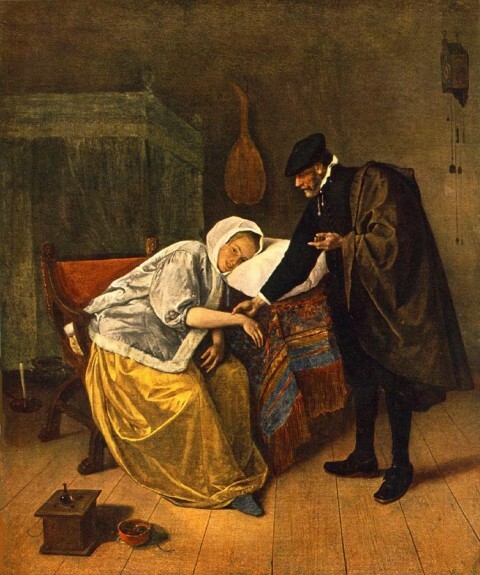 Images: Jan Steen, ​The Sick Woman, ​ before 1679. 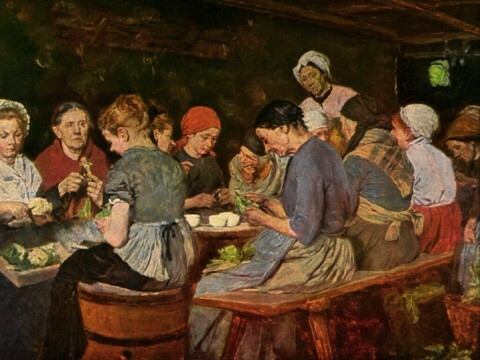 Max Liebermann, ​The Canning Factory, ​1879. As you all also know, two or three years is a lifetime in book years, so I’ve been doing almost no talking or promotion on that project for a while. That changes in a few hours, when I’ll spend an hour on Skeptically Speaking with Marie-Claire Shanahan talking Newton, crime, the birth of the modern idea of money, and wherever else the conversation wanders. The show starts at 8 p.m. EDT, 6 p.m. MDT, and will go up as a podcast next Friday. Listen here, and or subscribe via iTunes. It probably isn’t too much of a spoiler to say that it wasn’t the brightest move of even a genuinely clever criminal to try to match wits with my man Izzy. Just sayin…. 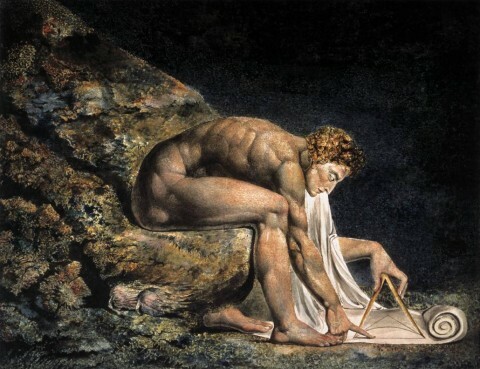 Image: William Blake,Isaac Newton, 1775.